Underwriting Analyst is involved in analyzing and processing the paper works or electronic applications for the insurance firms. They are basically responsible for preliminary risk assessment procedures. Some of the work activities that are commonly depicted in the Underwriting Analyst Resume are reviewing the insurance applications, assessing the background and financial status of the client, liaising with specialists for gathering opinions or information, determining underwriting alternatives, drawing quotes, negotiating and defining specific insurance policy terms, balancing mass and risk homogeneities for predicting future results, developing a profitable book of business and adhering to applicable insurance laws. Ambitious Underwriting Analysts with hands-on experience in statistical packages like SPSS, databases, Spreadsheets, “Smart Systems” and analytical tools coupled with proven numerical and statistical skills can secure a job as Underwriting analysts; Employers prefer candidates’ who hold a degree in Finance, Administration or similar field for filling this job position. Skills : Microsoft Excel, Microsoft Access, Microsoft Word, Microsoft Outlook, ADP, Mail Merge, And Data Entry. Worked under the direct supervision of senior underwriters on Freddie Mac and Fannie Mae senior housing, Freddie Mac SBL, and Fannie. Prepared underwriting workbook template for underwriters by reviewing and spreading historical operating statements, rent roll, pricing, and loan type and terms information from an application. Responsible for collection and review of all outstanding due diligence items and updating checklists. Responsible for reviewing bank statements and verifying borrowers liquidity. Reviewed municipal zoning codes and prepared zoning analysis and threshold analysis for non-conforming properties. Reviewed all third-party reports for accuracy and engaged appraiser and engineer for corrections and revisions. Complete various sections of the underwriters narrative, including but not limited to the following; property information, market information. Performed site inspections including unit walk-through, management interviews, lease audits, and rent roll analysis to determine the accuracy of the third party reports and to confirm the asset quality. Research property taxes to verify payment, outstanding taxes, exemptions, and appeals. Review borrower organizational structure and documents and creating organizational charts when required. Participated in the underwriting of two Freddie Mac SBL portfolios of over $100m in q4 2017. Maintained monthly pipeline of 12-14 loans with balances ranging from $800k to $25m. 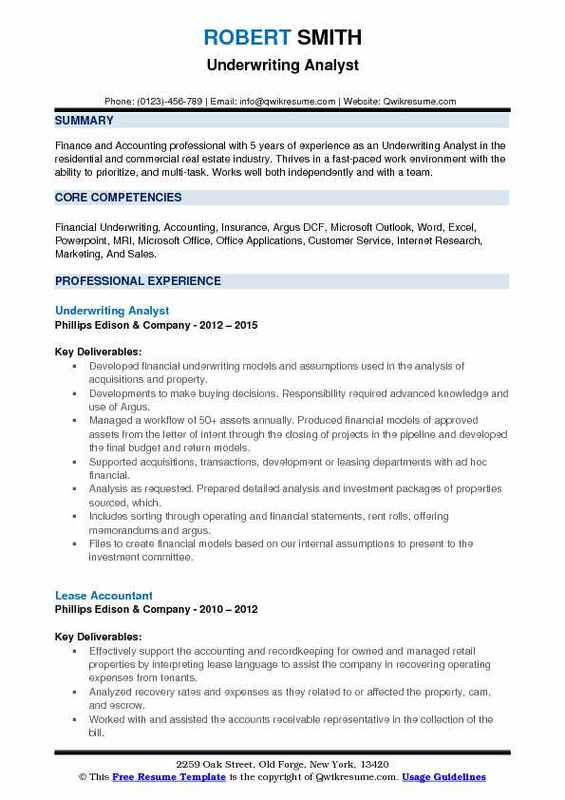 Objective : Finance and Accounting professional with 5 years of experience as an Underwriting Analyst in the residential and commercial real estate industry. Thrives in a fast-paced work environment with the ability to prioritize, and multi-task. Works well both independently and with a team. Skills : Financial Underwriting, Accounting, Insurance, Argus DCF, Microsoft Outlook, Word, Excel, Powerpoint, MRI, Microsoft Office, Office Applications, Customer Service, Internet Research, Marketing, And Sales. Developed financial underwriting models and assumptions used in the analysis of acquisitions and property. Developments to make buying decisions. Responsibility required advanced knowledge and use of Argus. Managed a workflow of 50+ assets annually. Produced financial models of approved assets from the letter of intent through the closing of projects in the pipeline and developed the final budget and return models. Supported acquisitions, transactions, development or leasing departments with ad hoc financial. Analysis as requested. Prepared detailed analysis and investment packages of properties sourced, which. Includes sorting through operating and financial statements, rent rolls, offering memorandums and argus. Files to create financial models based on our internal assumptions to present to the investment committee. Selected as part of a small group to report to CFO and the VP of finance, underwriting an existing. Funds 90+ assets by building argus files and cash flow projections. This analysis was utilized as the baseline for establishing a valuation for the fund, meeting a short timeline of 3 months. Cross-trained as a transaction analyst in an effort to expand skill-set. Managed the due diligence process in the acquisition of an asset in Illinois. The project consisted of a site visit and coordinating with prior. Owners property management and accounting group, coordinating with vendors and title and conducting tenant interviews managing due diligence from contract execution to closing. 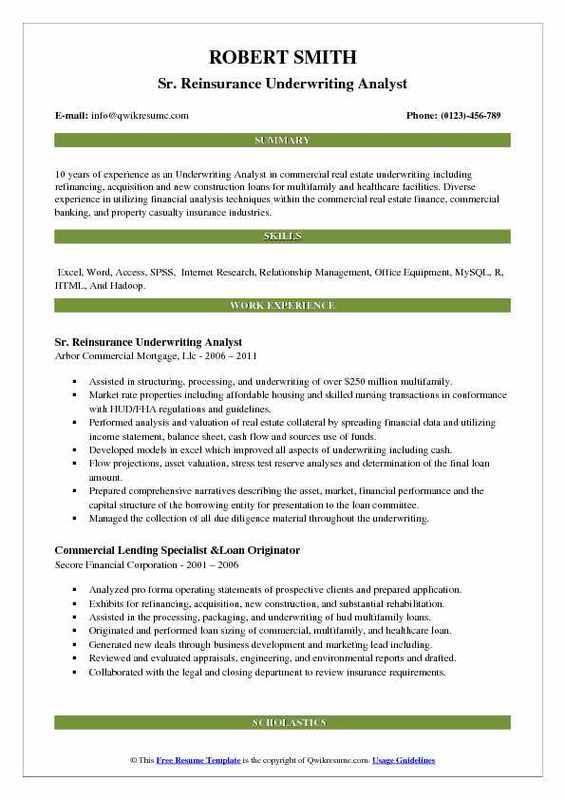 Summary : 10 years of experience as an Underwriting Analyst in commercial real estate underwriting including refinancing, acquisition and new construction loans for multifamily and healthcare facilities. Diverse experience in utilizing financial analysis techniques within the commercial real estate finance, commercial banking, and property casualty insurance industries. Skills : Excel, Word, Access, SPSS, Internet Research, Relationship Management, Office Equipment, MySQL, R, HTML, And Hadoop. Assisted in structuring, processing, and underwriting of over $250 million multifamily. Market rate properties including affordable housing and skilled nursing transactions in conformance with HUD/FHA regulations and guidelines. Performed analysis and valuation of real estate collateral by spreading financial data and utilizing income statement, balance sheet, cash flow and sources use of funds. Developed models in excel which improved all aspects of underwriting including cash. Flow projections, asset valuation, stress test reserve analyses and determination of the final loan amount. Prepared comprehensive narratives describing the asset, market, financial performance and the capital structure of the borrowing entity for presentation to the loan committee. Managed the collection of all due diligence material throughout the underwriting. Process and prepared credit analyses write-ups in order to assess the borrowers. 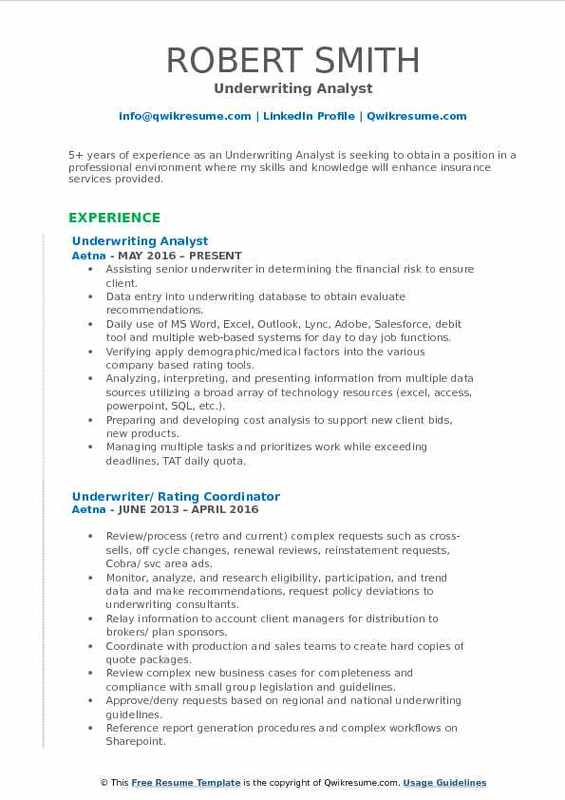 Headline : 5+ years of experience as an Underwriting Analyst is seeking to obtain a position in a professional environment where my skills and knowledge will enhance insurance services provided. 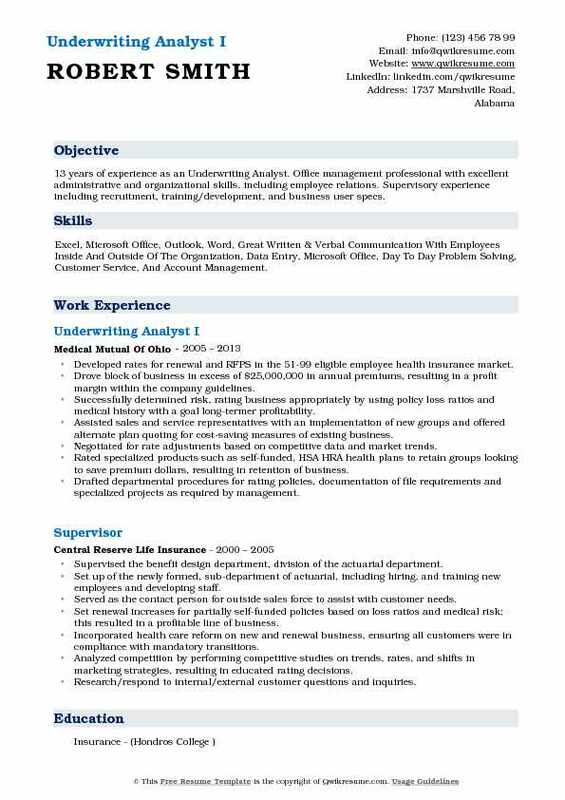 Skills : Insurance, Microsoft Office, Office Applications, Customer Service, Internet Research, Relationship Management, And Office Equipment. Assisting senior underwriter in determining the financial risk to ensure client. Data entry into underwriting database to obtain evaluate recommendations. Daily use of MS Word, Excel, Outlook, Lync, Adobe, Salesforce, debit tool and multiple web-based systems for day to day job functions. Verifying apply demographic/medical factors into the various company based rating tools. Analyzing, interpreting, and presenting information from multiple data sources utilizing a broad array of technology resources (excel, access, powerpoint, SQL, etc.). Preparing and developing cost analysis to support new client bids, new products. Managing multiple tasks and prioritizes work while exceeding deadlines, TAT daily quota. Developing comparative analysis of claim expense across multiple carriers. Reviewing IMQS/ medical applications to identify medical conditions access risk points to determine the risk to ensure potential client(s). 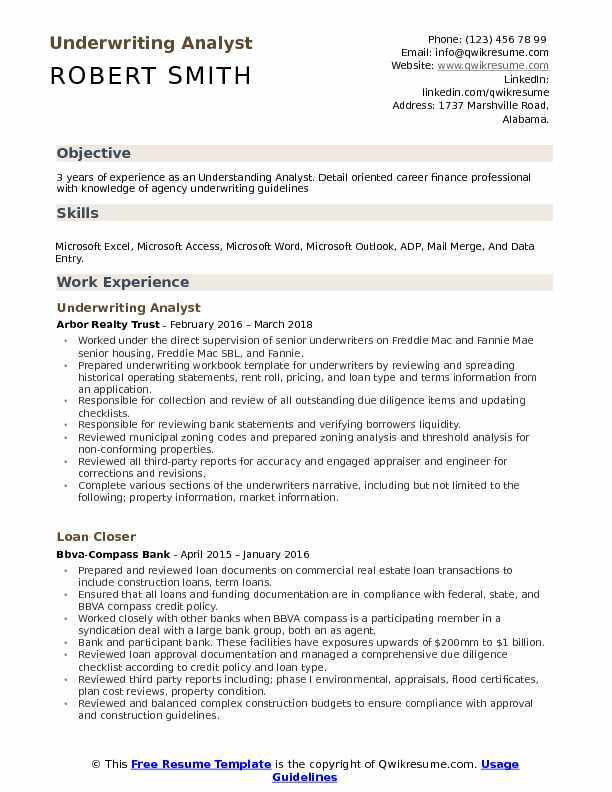 Objective : 3 years of experience as an Underwriting Analyst. 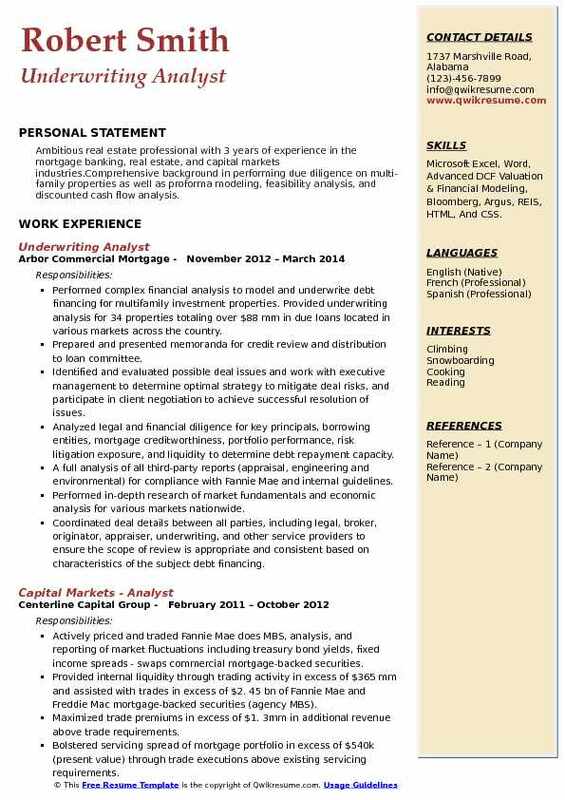 Experienced professional with a comprehensive background in mortgage & finance with a solid academic foundation seeking to acquire an opportunity within my field of study. Skills : Microsoft Office, MySQL, R, HTML, Hadoop, Great Written & Verbal Communication With Employees Inside And Outside Of The Organization, Data Entry, Microsoft Office, Customer Service, And Account Management. Prepared mortgage loans for underwriting and follow the appropriate guidelines. Analyze income, debt, credit history and other factors in order to accurately approve or recommend denial of mortgage applications within the allowed lending authority limits; work with senior underwriters and secondary market representatives as needed to assist with gathering and processing documentation. Organized request and prepare all essential documentation for the mortgage loan file from processing to closing; order and review credit reports, review content for inclusion and accuracy, including signed and dated application, general authorization, rate lock and servicing disclosure, wage, and tax information. Financial statements, legal documents such as divorce decrees and child support, construction documents, flood certificate, HMDA, and other necessary or pertinent documentation; verify that required information has been mailed, including the "truth in lending" and disclosure and other necessary documents; review. Perform financial analysis, such as cash flow and collateral analysis. Assists in the underwriting process by ensuring the accuracy and/or completeness of relevant information and documents. Collect and review relevant financial statements from relationship managers. 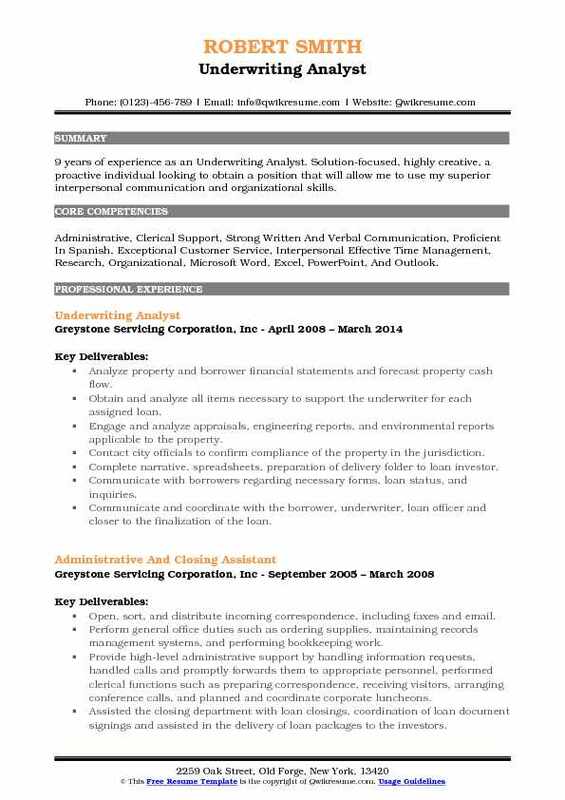 Summary : 13 years of experience as an Underwriting Analyst. Office management professional with excellent administrative and organizational skills, including employee relations. Supervisory experience including recruitment, training/development, and business user specs. Skills : Excel, Microsoft Office, Outlook, Word, Great Written & Verbal Communication With Employees Inside And Outside Of The Organization, Data Entry, Microsoft Office, Day To Day Problem Solving, Customer Service, And Account Management. Developed rates for renewal and RFPS in the 51-99 eligible employee health insurance market. Drove block of business in excess of $25,000,000 in annual premiums, resulting in a profit margin within the company guidelines. Successfully determined risk, rating business appropriately by using policy loss ratios and medical history with a goal long-termer profitability. Assisted sales and service representatives with an implementation of new groups and offered alternate plan quoting for cost-saving measures of existing business. Negotiated for rate adjustments based on competitive data and market trends. Rated specialized products such as self-funded, HSA HRA health plans to retain groups looking to save premium dollars, resulting in retention of business. Drafted departmental procedures for rating policies, documentation of file requirements and specialized projects as required by management. 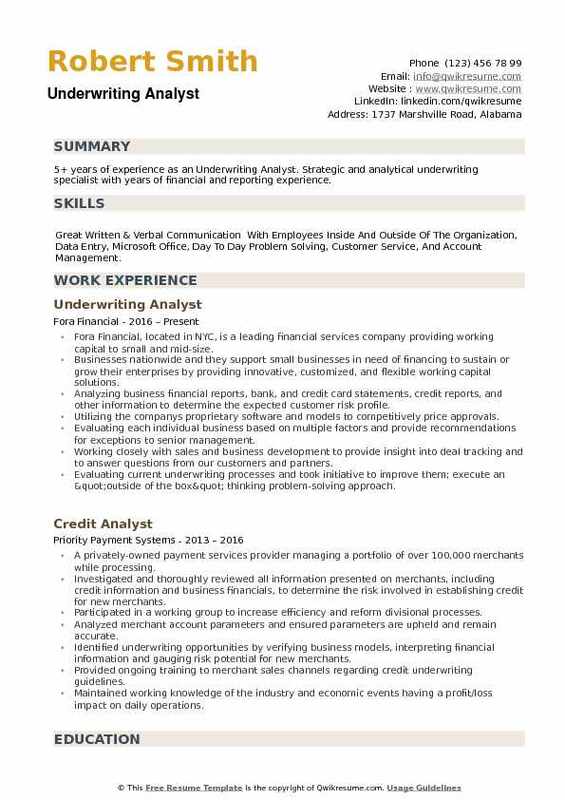 Summary : Goal-driven Underwriting Analyst/Financial Consultant with 7+ years of experience, background in borrower management combined with a history of implementing strategies to expand business opportunities. Display sound financial planning knowledge and a keen understanding of underwriting practices. Skills : FHA, MAP, Processing/Analyst, Microsoft Office, MS Word, Excel, General Lines Agent Property, Casualty, And PowerPoint. Specialize in federal housing administration (FHA) multifamily loans. Work alongside certified multifamily accelerated. Program (map) underwriters for processing, underwriting, and closing of loans through the following programs: 220 sub-Rehabilitation programs; 223(f) refinance program; 221(d) 4 new construction program; and 232/223(f) lean healthcare. Executing a preliminary analysis of borrower personal financial statements, real estate owned (REO) schedules, and resumes for loan eligibility. Conducting analysis of multifamily property operating statements, tax returns, and rent rolls to maintain stability and profitability. Managing the collection, examination, and packaging of all housing and urban development (HUD) required a loan. Documents for primary submission to the respective hud/hub/field office. Research/respond to internal/external customer questions and inquiries. Complete due diligence, document processing and financial/statistical analysis in support of the underwriting function. Assist in preparation of business cases for credit approval. 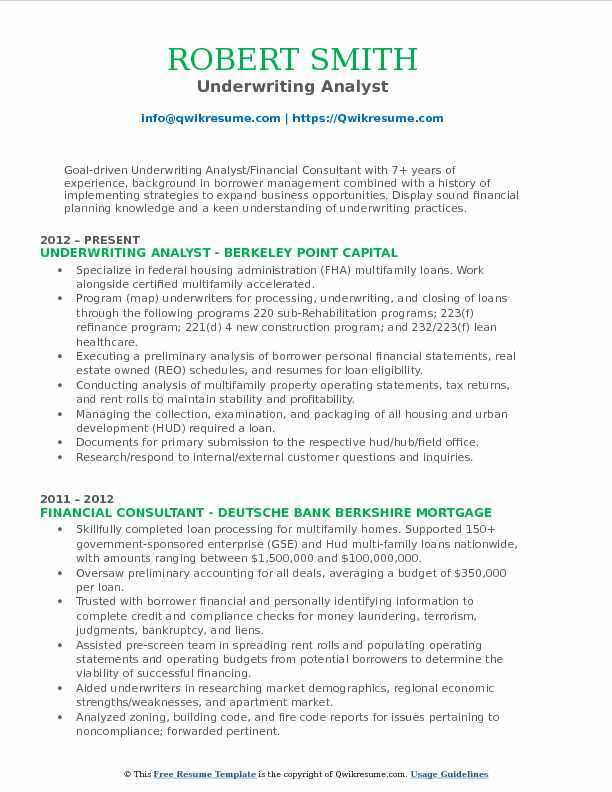 Summary : 9 years of experience as an Underwriting Analyst. Solution-focused, highly creative, a proactive individual looking to obtain a position that will allow me to use my superior interpersonal communication and organizational skills. Skills : Administrative, Clerical Support, Strong Written And Verbal Communication, Proficient In Spanish, Exceptional Customer Service, Interpersonal Effective Time Management, Research, Organizational, Microsoft Word, Excel, PowerPoint, And Outlook. Analyze property and borrower financial statements and forecast property cash flow. Obtain and analyze all items necessary to support the underwriter for each assigned loan. Engage and analyze appraisals, engineering reports, and environmental reports applicable to the property. Contact city officials to confirm compliance of the property in the jurisdiction. Complete narrative, spreadsheets, preparation of delivery folder to loan investor. Communicate with borrowers regarding necessary forms, loan status, and inquiries. Communicate and coordinate with the borrower, underwriter, loan officer and closer to the finalization of the loan. Obtain property tax information and confirm ownership structure on title profiles. 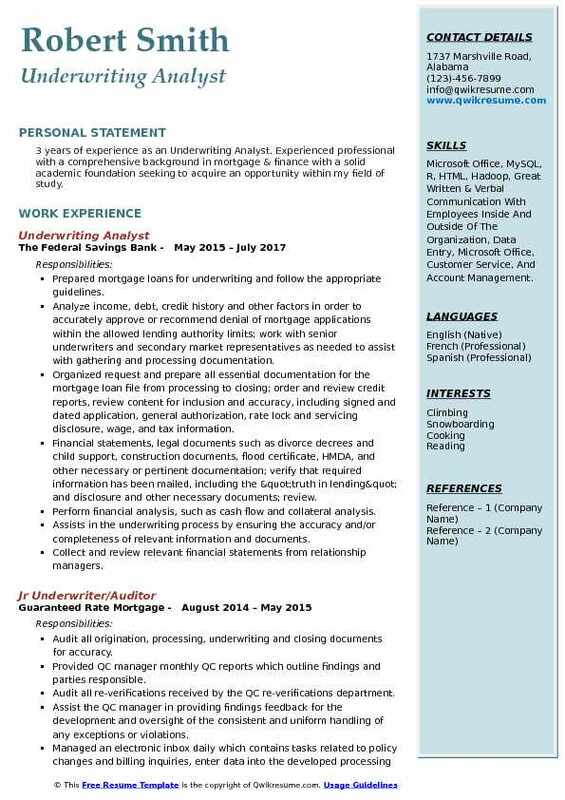 Objective : Ambitious real estate professional with 3 years of experience in the mortgage banking, real estate, and capital markets industries.Comprehensive background in performing due diligence on multi-family properties as well as proforma modeling, feasibility analysis, and discounted cash flow analysis. Skills : Microsoft Excel, Word, Advanced DCF Valuation & Financial Modeling, Bloomberg, Argus, REIS, HTML, And CSS. Performed complex financial analysis to model and underwrite debt financing for multifamily investment properties. Provided underwriting analysis for 34 properties totaling over $88 mm in due loans located in various markets across the country. Prepared and presented memoranda for credit review and distribution to loan committee. Identified and evaluated possible deal issues and work with executive management to determine optimal strategy to mitigate deal risks, and participate in client negotiation to achieve successful resolution of issues. Analyzed legal and financial diligence for key principals, borrowing entities, mortgage creditworthiness, portfolio performance, risk litigation exposure, and liquidity to determine debt repayment capacity. A full analysis of all third-party reports (appraisal, engineering and environmental) for compliance with Fannie Mae and internal guidelines. Performed in-depth research of market fundamentals and economic analysis for various markets nationwide. Coordinated deal details between all parties, including legal, broker, originator, appraiser, underwriting, and other service providers to ensure the scope of review is appropriate and consistent based on characteristics of the subject debt financing. Headline : 5+ years of experience as an Underwriting Analyst. Strategic and analytical underwriting specialist with years of financial and reporting experience. Skills : Great Written & Verbal Communication With Employees Inside And Outside Of The Organization, Data Entry, Microsoft Office, Day To Day Problem Solving, Customer Service, And Account Management. Fora Financial, located in NYC, is a leading financial services company providing working capital to small and mid-size. Businesses nationwide and they support small businesses in need of financing to sustain or grow their enterprises by providing innovative, customized, and flexible working capital solutions. Analyzing business financial reports, bank, and credit card statements, credit reports, and other information to determine the expected customer risk profile. Utilizing the company's proprietary software and models to competitively price approvals. Evaluating each individual business based on multiple factors and provide recommendations for exceptions to senior management. Working closely with sales and business development to provide insight into deal tracking and to answer questions from our customers and partners. Evaluating current underwriting processes and took initiative to improve them; execute an "outside of the box" thinking problem-solving approach.